PRODUCT: BASF Masterflow 1205 Cable Grout. Pumpable grade High-Strength Non-Shrinking Extended Working Time Grout. 55 Lb./Bag. Price/Bag. 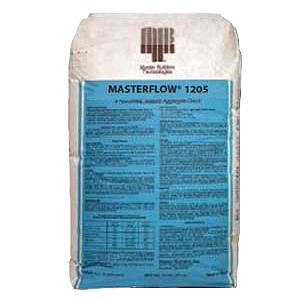 Masterflow® 1205 is a cement based pumpable grout with specially graded aggregate. It produces a pumpable, nonbleeding, high-strength fluid product with an extended working time. The specially graded aggregate mitigates chloride migration while still allowing the product to be easily pumped over long distances through small openings. It meets all the compressive strength and nonshrink requirements of CRD C 621 and ASTM C 1107, Grades B and C, at a fluid consistency. • Pumping around post-tensioned tendons, cables, and rods to encapsulate and protect highly stressed steel from corrosion.